A Great way to include your guests in the Ceremony! Everyone is given a Shell or Stone as they arrive to your ceremony. They are asked to hold on to it until after the Recessional where everyone goes to the waterline and throws them into the Gulf of Mexico together to say a Prayer, Wish or Blessing for your Marriage. 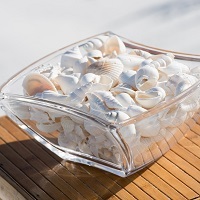 Includes a Bamboo Table or White Pedestal, Crystal Bowl, and Your Choice of Stones or Shells.